Each of these situations, or a combination of several, has the potential to cause damage to teeth, gums and soft and hard tissues of the mouth. Our dentists perform a thorough examination of your teeth and mouth on a regular basis, with the intention of identifying problems as early as possible. It’s often possible to prevent disease from developing, to reverse the early stages of decay or gum disease, and, if dental disease is present, it’s better to restore teeth when damage is minimal. We also have a large range of quality oral health products, including speciality toothpastes, for sale at very competitive prices (prevention is so important to us that we don’t mark up the prices, we just cover our costs!). The benefits of taking a proactive and preventive approach to your dental health is that you’ll probably find you’ll need less comprehensive (and expensive!) work over your lifetime. 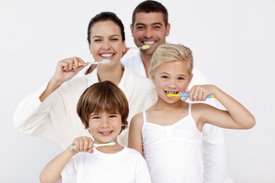 We enjoy supporting people who share our proactive, preventive approach to dental health! Contact us to get started.